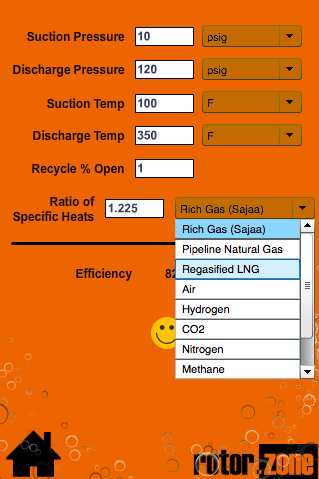 A powerful set of four gas compressor utilities. The utilities cover air, natural gas, hydrogen and CO2 compressors along with prime movers (turbines, motors and engines). The software supports both Metric and US measuring systems and includes most major classes of compressors (Centrifugal, Reciprocating, Screw, Vane and Axial Flow). 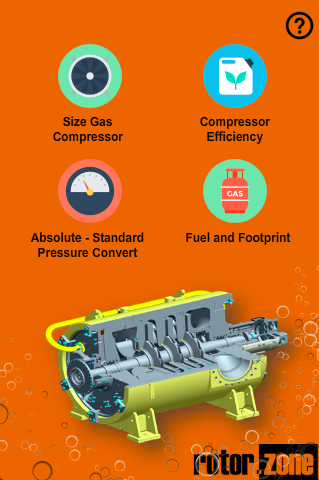 4 Powerful Gas Compressor Utilities to Size Gas Compressors, Calculate Compressor Efficiency, Calculate Fuel Consumption and Convert Standard / Absolute Pressures. The utilities cover air, natural gas, hydrogen and CO2 compressors along with prime movers (turbines, motors and engines). 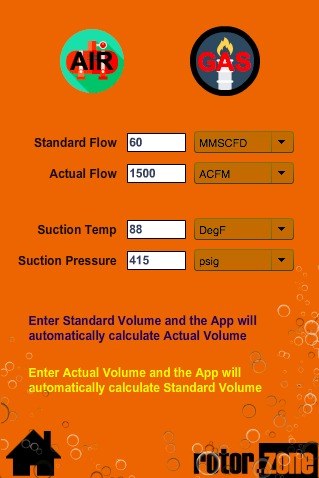 The software supports both Metric and US measuring systems and includes most major classes of compressors (Centrifugal, Reciprocating, Screw, Vane and Axial Flow). 1 - Cooling from driver refers to cases where the cooler is mechanically driven from the driver (common for gas engine driven reciprocating compressors). In this case the recommended size of the driver will increase. 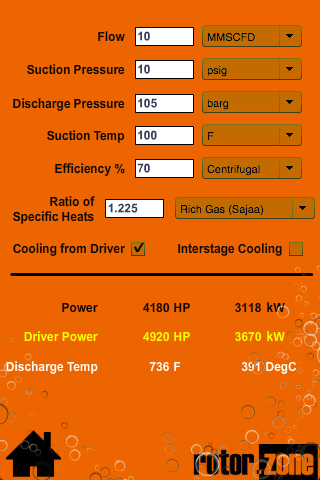 2 - If Intercooler checkbox is selected discharge temperature will not be calculated and consumed HP will increased due to predicted pressure losses in the cooler. 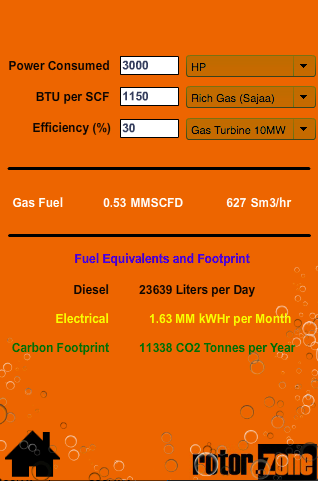 1 - The app calculates efficiency on an isentropic basis. The isentropic model has been used in the rotor.zone application primarily because it gives more reliable results in field tests.